survival benefits that it depends upon to mitigate the effects of the FRCPS actually are accruing." Legal adversaries say that implementation of a federal Columbia/Snake river salmon protection plan is lagging, not producing the intended benefits and that the agencies are plunging ahead without acknowledging that significant changes are needed to meet the requirements of both fish and the law. The criticisms from a coalition of fishing and conservation groups led by the National Wildlife Federation, the state of Oregon and the Nez Perce Tribe came in the form of Oct. 31 comments to Oregon's U.S. District Court. The comments respond to the federal "action" agencies' Sept. 28 "2011 Annual Progress Report" on their implementation of NOAA Fisheries' 2008/2010 Endangered Species Act biological opinion on the Federal Columbia River Power System. That BiOp includes habitat, harvest, hatchery and hydro system mitigation actions aimed at improving survival of ESA-listed salmon and steelhead stocks that are negatively impacted by the 14-dam FCRPS, which includes hydro projects in the Columbia and Snake river basins. A total of 13 basin salmon and steelhead species are listed. The BiOp emphasizes the protection of naturally born members of the species as opposed to hatchery fish. 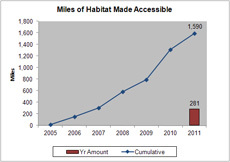 The action agencies report on 2011 activities describes their "their comprehensive effort to protect ESA-listed salmon and steelhead throughout their lifecycle with hydrosystem, habitat, hatchery, harvest and predator management actions under NOAA Fisheries' 2008 biological opinion. "Performance standard testing at The Dalles, McNary and Bonneville Dams showed marked improvements in survival of juvenile spring chinook and steelhead at all three projects. Dam modifications and spill/surface passage improvement appear to be on track to achieve the hydrosystem performance standards - 96 percent average per dam for spring migrants and 93 percent for summer migrating fish." Those performance standards judge survival at each of the dams specifically - through the actual "concrete." "The travel time for juvenile salmon and steelhead migrating through the hydrosystem was among the fastest scientists have observed. NOAA believes this is likely due to high levels of flow in 2011 and the continued use of spill and surface bypass at the dams," the report says. "The agencies and their partners opened up more than 280 miles of salmon and steelhead spawning and rearing habitat. Research has shown that size and connectivity is the strongest predictor that salmon and steelhead will spawn in a specific area." Judge James A. Redden in August 2011 declared the 10-year BiOp arbitrary and capricious and illegal under law. He ordered NOAA to produce a new BiOp by the end of 2013 that better detailed the planned mitigation actions, and the survival benefits they would produce. The current BiOp puts a heavy emphasis on boosting survival through habitat improvements. "Coupled with the significant uncertainty surrounding the reliability of NOAA Fisheries' habitat methodologies, the evidence that habitat actions are falling behind schedule, and that benefits are not accruing as promised, NOAA Fisheries' approach to these issues is neither cautious nor rational," the judge said in his August 2011 order. "No later than Jan. 1, 2014, NOAA Fisheries shall produce a new biological opinion that reevaluates the efficacy of the RPAs in avoiding jeopardy, identifies reasonably specific mitigation plans for the life of the biological opinion, and considers whether more aggressive action, such as dam removal and/or addition flow augmentation and reservoir modifications are necessary to avoid jeopardy" to the listed species, Redden said. "As a practical matter, it may be difficult for Federal Defendants to develop a long-term biological opinion that relies only on mitigation measures that are reasonably certain to occur." The BiOp's "reasonable and prudent alternative" describes desired mitigation actions. He did order that the 2008/2010 BiOp remain in place through Dec. 31, 2013, so that "beneficial measures" it contains would be implemented. Redden also required that action agencies report annually on BiOp implementation progress. He offered litigants the opportunity to comment on each annual report. In this case the plaintiffs in the lawsuit, NWF and Oregon, filed briefs Wednesday, as did the Nez Perce Tribe, which has amicus curiae status and can thus offer information to the court. The tribe has aligned with the plaintiffs. Also offering comments were Northwest RiverPartners, a non-profit organization comprised of corporations, public and private power producers, ports, farmers and businesses. "RiverPartners supports the BiOP, although it is also the most expensive and ambitious restoration program for listed species which will be funded by the region's ratepayers for many years to come," the organizations brief said. It lauds the collaborative efforts developed that involves the input of other stakeholders - such as Northwest states and tribes - in adaptive management of BiOp implementation. "The Annual Progress Report ("Report") demonstrates the numerous actions undertaken by federal, state, tribal and private parties to: 1) improve the hydropower infrastructure itself; (2) restore habitat throughout the region; and 3) ensure that hatcheries are functioning properly," the RiverPartners filing says. "BiOp measures -- including the 73 specific actions required by the RPA -- continue to be timely implemented, and fulfill state and tribal salmon 'Accords' requirements (which involve an investment by Northwest ratepayers of $100 million per year in habitat and hatchery projects)," RiverPartners says. The Accords are agreements signed by the federal agencies with states and tribes that promise funding for both ESA and non-ESA fish and wildlife projects. BPA provides much of the funding for the Accords through ratepayer revenues. "The 2011 Annual Report demonstrates that the on-going sovereigns collaboration and RIOG [Regional Implementation Oversight Group] oversight process is producing the desired results, and should continue to do so well into the future," RiverPartners says. NWF says the report on 2011 BiOp implementation progress, like its 2010 predecessor, lacks the detail necessary needed to drive adaptive management - changes to the program aimed at bringing needed survival improvements. ". . . the 2011 Report also fails to illuminate whether the specific actions described in the RPA are being implemented as anticipated in the 2008/2010 BiOps, whether the survival improvements from these actions, which NOAA determined are necessary to avoid jeopardy, are actually accruing as predicted, or what concrete actions the agencies have taken to compensate for any shortfall in either actions or survival improvements," the NWF comments say. "In short, the 2011 Report fails to provide a basis for the Court, the parties, or anyone else to evaluate whether, or the extent to which the RPA actually has been implemented, let alone whether the specific survival improvements from these actions have occurred." The Oregon filing with the court says that in the 2011 report "the federal agencies again downplay the adverse effects that the dams have on protected fish and build their case for operations that would reduce spill." Court mandates have since the 2006 prescribed levels of spill at FCRPS projects higher than those called for in federal management plans. "The 2011 APR reports improvements in juvenile dam passage survival of spring salmon and steelhead at several of the dams," the Oregon comments say. "However, it is notable that the agencies omit any attribution of this success to spill, despite an accumulating weight of scientific evidence that spill has significant survival benefits." "Like the 2010 APR, the 2011 APR can do no more than exhibit the weaknesses of the 2008/2010 BiOp. Among other defects, the APR shows the agencies do not have the means to ensure that the survival benefits that it depends upon to mitigate the effects of the FRCPS actually are accruing. "At the same time, the APR reveals the agencies' predilection to continue to avoid operational changes with known benefits. With the new or supplemental BiOp due in fourteen months, it appears to Oregon that the agencies are determined to build a case for reducing mainstem operations beneficial to salmonids, while simultaneously delaying the habitat actions they have committed to implement," Oregon says. The Nez Perce Tribe comments say that a progress report on implementation of a flawed BiOp "will suffer from the foundational flaws of that BiOp. "Despite the fact that similar concerns were raised with the 2010 Report, the 2011 Report (1) presents information in a way that is misleading and selective, and avoids or downplays mention of information that raises doubts about the RPA and might lead to a need to modify either the analysis or the conclusions of the 2008/2010 BiOp; (2) fails to report on information that the 2008-2010 BiOp itself required, particularly with respect to the habitat actions in the RPA; and (3) contains unsupported conclusions and assertions, that render it impossible for the parties, the Court or anyone else to assess the accuracy of the assessments."